The undeniable crisis of student debt has focused political debate on the question of college costs. Unfortunately state and federal politicians have concentrated their rhetoric and policy proposals on efforts to limit funding for Higher Education (as in arbitrarily constructed tuition limits or the imposition of state funding cuts); the search for technological ways to avoid broader social choices (as with online); or efforts to limit what disciplines students have access to (as in Rick Scott's plan to impose financial penalties for choosing certain fields of study). Although the attention to student debt and the burdens rising tuition places on families is overdue, the conventional wisdom all turns in one way or another on the reduction of access to quality higher ed for students in the future (either by limiting their credits, driving them through college more quickly, denying them the residential experience, or simply failing to fund colleges and universities adequately). As with so much else in our austerity addled age, the policy response to crises created by the stagnation of wages and the retreat of the social state is to tell people to settle for less in the future. For nearly half a century, California sought a different path: codified in the Master Plan (although predating it), the state committed its resources according to the notion that it could create and sustain a system of higher education that would, in turn help ensure mass access to quality higher education. This mass education, in turn, helped to enable California to sustain an economy based on knowledge industries and human creativity. This vision collapsed in the last decade. To revive it would take political leadership with a commitment to renewing California's commitment to broad based prosperity. Unfortunately, Jerry Brown remains the once and future Austerian. For whatever reason, oedipal or ideological, Brown has made his career out of the notion that people should expect less from their lives in society and that the government needs to minimize its efforts towards mass prosperity. While in the 1970s, Brown could plausibly link these notions to emerging ecological concerns now he simply mimics the idea that the disordered economy of finance capital cannot be challenged but simply borne. Under the name of fiscal prudence he doubles down on the limits to access and quality for the working and middle classes while refusing to challenge the inequalities that helped create the recent financial crisis. Brown's commitment to austerity can be seen in his budget proposals for Higher Ed. Although it is true that Brown declares that the state needs to "reinvest to improve the quality and affordability of California's system of Higher Education" (36) his actual policies belie this assertion. He does propose funding increases over the next few years but his 2013-2014 budget will leave both UC and CSU each down $600 Million in state funds compared to 2007-2008. (35) And even if the state does fulfill Brown's promises, the result after several years will be funding for UC and CSU at roughly 2010 levels--despite the rise in mandatory costs. Brown's budget proposals will lock in a permanent underfunding of CSU and UC by the state. In effect, Brown's vision of reinvestment is sustaining Higher Education in its present diminished state. Sadly, Brown represents the consensus in Sacramento. The recent Legislative Analyst Office's analysis of Brown's Higher Education proposals doubles-down on its most egregious assumptions and austerity proposals. The LAO report criticizes Brown both for his commitment to (limited) funding increases (17-18) and opposes Brown's proposal for a tuition freeze in part because the LAO thinks that it will lead to dramatically increased tuition in the future and in part because the LAO thinks students do not contribute enough to the cost of Higher Ed. (30-31) Instead of a tuition freeze, the LAO proposes that students be expected to cover a certain percentage of educational costs and that tuition rise or fall according to that standard. If Brown admits a funding problem but is unwilling to solve it, the LAO does not admit a funding problem to begin with. Central to their position is a joint refusal to acknowledge the substantial difference between state funding and tuition as the economic base for higher education. Both Brown and the LAO treat the transfer of burden from the government to students as inevitable and rational (although they do want to argue at the margins about what those burdens on students should be). In keeping with the dominant economic thinking of the last few decades they see no difference between public and private debt--or more precisely they seem more worried about public than private debt despite the reality that private debt is undermining the economic recovery. But just as importantly--and on this point, they support the austerity bubble-- they cannot imagine demanding of corporations or those who have benefited from increasing inequality to bear their fair share of burdens. But as dangerous as their approach is in general--in the case of higher education it is particularly self-defeating. Both the Governor (39) and the LAO (24-26) emphasize the need to improve the state's record in enabling students to complete their degree work. Both however overlook one substantial reason that students take longer to complete their degrees than in the past--the hours of employment they take on in order to pay for their part of their college education. As is typical of austerity economics, the Governor and LAO's blithe acceptance of the necessity of decreased state support has shifted the burden onto students, compelled them to spend more time at jobs and less time as students, and therefore slowed down their progress to degree. No fiddling with "bottleneck" courses will compensate for this time and labor. Indeed, an understanding of the significance of this shift of burdens reveals how shallow the Governor's understanding of Higher Ed is, and how problematic LAO's critique of his suggestions are. The telling point, not surprisingly, is their shared belief that online education will reduce instructional costs. But what they fail to acknowledge is that they have no genuine means of judging instructional costs. Let's take the LAO because they have the virtue of laying out their thinking. The LAO insists that spending per degree is high in California (11) and assumes that that is because of instructional inefficiency. But their position is based on a set of unjustified slippages. First, they take the total core funding of the university systems and the number of degrees and divide the former from the latter; then compare costs to other universities in the same institutional category. They do not calculate different costs of living, of materials, and of space in California compared to other places. Even more importantly, they assume that dividing total revenues by degrees provides a meaningful window into instructional costs and efficiencies. But as we all know that is a poor proxy; there are far too many other sources of costs (pertaining to administration, compliance, research, student services, etc) to allow the state government to assume that the instructional costs of California Higher Ed are unusually high and to use that as an excuse to reduce students shared learning experience while increasing their burdens. In response, the University systems must do more than simply thank Brown for not cutting them further. In the case of UC two things need to be done to start a new debate on Higher Ed. First, UCOP must stop allowing the State to treat public funds and student tuition as interchangeable sources of revenue. It may be impossible in the short term for the University to change this dynamic but it can at least refuse to allow the logic of this displacement to go unchallenged. If UCOP doesn't do so then its purported concern for student's burdens will ring increasingly hollow. But the system-wide Academic Senate has a role to play as well. For too long, faculty have allowed the conflation of instructional costs and institutional costs to go unchallenged. The Senate, admittedly, has limited power. But its system-wide committees do have oversight functions and they should seek to press the administration (both in Oakland and on campuses) for a fuller accounting on costs. Doing so will not cure our problems--indeed it will likely only open up difficult debates about priorities. But by insisting on a clearer accounting of costs it will enable Faculty to reassert the centrality of the instructional mission to the University. If we cannot do that we may find ourselves marginal to the Institution itself. Does California, or any other "knowledge economy," want to have public research universities, in the sense of paying for them? We have reached a point in the ongoing higher ed crisis where this is a genuine question. By "research" university I mean one that conducts research across the disciplinary spectrum and that has the doctoral programs on which research depends. But I also mean, for the state's undergraduates, a university that connects students to brand-new knowledge and thus to tomorrow's skills today. Putting regular folks on the technological, social, and cultural cutting edge is a unique and fragile--and enormously valuable--activity. That is what public research universities uniquely do. This week's Legislative Analyst's Office report on Gov. Jerry Brown's higher ed budget proposal displayed the LAO's traditional dismissal of the research university's interest to the state. But they are not alone. The recent California Higher Education Summit, MCed by KPPC Airtalk host Larry Mantle, also mounted a direct challenge to the value of the category public research university. We have posted a base transcript of the exchanges between Mantle and UC president Mark Yudof (thanks to UCSB's Alysse Rathburn). Larry Mantle began the discussion by noting that the Master Plan was "the model to which everyone aspired. For extremely low, or even no tuition, students had access to one of the three systems." The frame is what I like to call mass quality, in which first-rate educational skills are not reserved for an elite but are distributed to every income level in the population. Well, you're bound to get concerns when you have a ratio of 2000 to 1 for counselors to students [sic]. That's the average up and down the state. The Master Plan for Higher Education is still the most elegant public higher education system in the world. It's jut grossly underfunded. Underfunding has been going on so long that it has terminated normal operations at the CCCs and CSU, who turned away hundreds of thousands of students, and compromised educational quality at UC. In addition, there is little sign that underfunding will end soon. Leading lights like Jerry Brown and Barack Obama are first and second generation austerity Democrats, who call for next generation technologies, industries, and workforce skills on the basis of next to no new public investment. Given the intersection of public-sector poverty and imposed austerity, Mr. Mantle saw mass access being put at risk by the costs of the research segment, the University of California, which he described as elite. What about professors’ salaries though? Because my sense is, at least for star faculty, maybe this doesn’t apply across the board – there’s been a kind of race to getting the top talent. UC wants to get the very best and the brightest; as professors you’ve got to compete with private, as well as other really public institutions. So, has the cost of faculty salaries not risen faster than the rate of inflation? What used to be a very middle class job, hasn’t that become a very distinctly upper middle class job? a solid 10, 15 percent below our peers, both public and privates. So I would say we have a very public-spirited faculty. If you teach at [UC], . . . half your kids are poor. You are an agent of upward mobility. Mr. Yudof continued on about the relatively low cost of UC's "60 Nobel laureates. I'd prefer they not leave our campuses." Mr. Mantle, however, was worried about the costs of exactly this kind of elite quality. "It's a wonderful thing you've got them. But they cost money." He made this more explicit later on. The University of Texas, your former system, President Yudof, has been ground zero in this battle between those who believe that maybe some of these elite public universities have become too elitist, and no longer affordable for states to fund them in this age of belt tightening. So, is this question over whether we can still afford a University of Texas or a University of California with all of its overhead, with all of what goes on – is that a legitimate debate in your mind to have? Or are things just great, these institutions need to be protected as is? This is a profound, important social question that deserves two serious answers. Research universities need to protected and upgraded. Great ones deliver far more value to students and society than do average ones, especially in our absurdly competitive global innovation economy. It would be a start to offer simple language about making California an "educational leader" once again. Research loses money now, for the sake of big returns later. Only the public sector will take the important risks on high-value, basic research. Private firms can't justify it to their accountants or shareholders. The state has to cost share with the federal government. This is not what the audience heard. Instead of (1), Mr. Yudof said that public research universities don't need to be protected, that we're not "going to have a 14 to one student faculty ratio" any more, and waxed on at a couple of points about how we're going to keep having bigger classes and more distance learning. This kind of answer just begs the question, so if the research university keeps getting worse, why does it keep costing more? More generally, why would the public want to pay for expensive OK quality? Instead of (2), explaining the real economics of research, Mr. Yudof doubled down on the false assertion that extramural research is a big profit center for the University. Responding to a question about more sources of income, one exchange went like this. Yudof: We can raise more money from the private sector. We have indirect cost recovery. But if you’re sitting there at Berkeley you’re getting 240 million dollars from the state of California, and the faculty is bringing in 800 million dollars of research, would you, Larry – I have a question – would you give up the 800 million? Mantle: Well, no. And if research is actually making money, or paying for itself, why aren’t you going out hiring more professors to do research, if it’s that lucrative? Yudof: We actually are. Every time somebody does a study, and says, “Boy, you’ve got so many administrators," it always turns out that they’re either in the hospitals, where they’re doing booming business, or the research enterprise. Mr. Yudof is citing gross research revenues. Net research revenues are negative, and an NSF report last fall finally confirmed that average losses are around 20 cents on the income dollar, even after indirect cost recovery is factored in (the one bit of UC coverage is here). 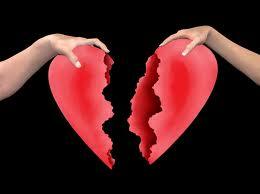 I'm writing this on Valentine's Day, and am sorry to report that Mark Yudof's answers broke my heart. Public research universities are losing the framing wars because they aren't explaining why their costly knowledge-creation is special, or that this special function always needs public funding support. As a result, someone listening to this summit could reasonably conclude that (1) the higher costs of research universities are blocking access to basic college education for veterans, working class students, immigrants, among many deserving others, and (2) that the great money-making scientific enterprise could easily be used to support UC students. So, this line would conclude, move UC's state money over to the suffering CSU and CCC systems, and let science profits make UC self-supporting. This is where public research universities have long been headed -- towards self-supporting status. But it is a political dependent and financially diminished one, which ironically includes exactly the higher tuition and lowered access that the public fears. It's going to take a huge collaborative effort to tell the truth to the public and to state government about the real costs and real uses of the public research university. While Gov. Jerry Brown's interest in online education captured the most headlines last month, the principles in his budget proposal for California higher education are more important. The first principle is that correct public funding is essential to the combination of high quality and full access that made UC such a special exemplar of the potential of public higher ed. The Governor’s budget says that “the state must begin to reinvest to improve the quality and affordability” of higher ed. This is completely right. A central finding of our detailed study of UC’s budget, known as the "Futures Report" (2006) was that public funding cannot be replaced by private funds in the form of gifts and research sponsorships. More important, the Futures report concluded that the only way to replace public funding was with massive tuition hikes that were unacceptably large. The third and most important principle is to compare growth in higher ed budgets to the rate of state income growth, which the Governor’s budget proposal notes has “averaged slightly less than 4 percent per year.” We have argued that this benchmark would both control costs and prevent destructive cuts to the state’s capacity to create new knowledge, capable citizens, and a creative workforce on the large scale required. A problem arises with the Governor’s affirmation of this principle right now, in a deep funding trough created by massive cuts. 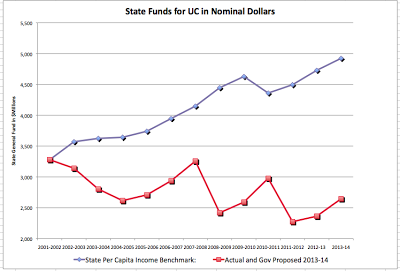 Our chart shows where UC funding would have been if the state had followed Gov. 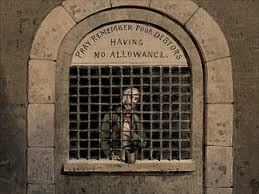 Brown’s “income principle” for the past decade. Past policy has been to privatize public university funding by deliberately shifting costs to students. So there is now a huge gap between "normal" general fund growth and UC's actual public funding level. The gap has been only partially filled by a tripling of tuition over this time period, but even these large tuition increases, once enrollment growth and financial aid are deducted, have covered 38 percent of the loss of state funding, according to University estimates. Governor Brown notes the resulting damage to both quality and affordability. He cannot, however, fix UC or CSU’s quality while simultaneously capping tuition and keeping state funding at their lowest per-student level in modern history--58 percent below its 2000-01 level (Display 7). To be consistent, the Governor would need to tie UC funding to income growth not just right now, at a historic low, but over the long term. He would also need to propose a long-term plan to get public funding back on track—precisely so that tuition increases can be halted or, better yet, rolled back, even as quality is improved. Finally, it has been suggested by University officials and many others that it is too late to fix the gap and that we should give up on fixing public funding. This view is factually incorrect. Glantz and Eric Hays have updated their report on how much it would cost to restore UC quality and affordability to 2000-01 levels. Their answer includes not only the restoration of state funding whose decline is shown above, but also a tuition rollback to 2001 levels ($5278 in current dollars). The recovery that the Governor's budget envisions, including not simply a tuition freeze but a tuition rollback for California’s entire higher education system (UC, CSU and the community colleges), would cost the median taxpayer $48 per year. We assume that the Governor is serious about ”reinvest[ing] to improve the quality and affordability of California’s system of higher education.” We hope that he will maintain a logical consistency between his call to restrain tuition growth and the public funding recovery that this entails. He – and all of us – need to study the graph above and move UC (and all of higher ed) back to the blue line, which stands for funding full educational quality for the next generation of students. 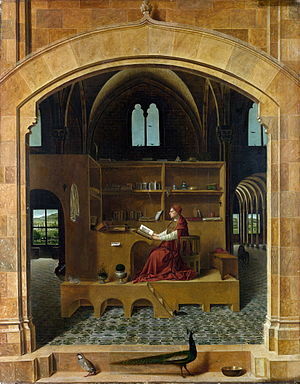 Antonello da Messina, St. Jerome in his Study (1460s). The quantitative trader Nassim Nicholas Taleb became famous after the publication of his book The Black Swan, which analyzed events that disrupt or shatter systems but that are unanticipated because they are so rare. He became a major explainer of the 2008 crisis based on his long term study of nonlinear systems, uncertainty, and how things react to random events. One passage his new book, Antifragile: Things that Gain from Disorder, picks up there. "After the crisis of the late 2000s, I went through an episode of hell owing to contact with the press. I was suddenly deintellectualized, corrupted, extracted from my habitat, propelled into being a public commodity. I had not realized that it is hard for members of the media and the public to accept that the job of a scholar is to ignore insignificant current affairs, to write books, not emails, and not to give lectures dancing on a stage; that he has other things to do, like read in bed in the morning, write at a desk in front of a window, take long walks (slowly), drink espressos (mornings), chamomile tea (afternoons), Lebanese wine (evenings), and Muscat wines (after dinner), take more long walks (slowly), argue with friends and family members (but never in the morning), and read (again) in bed before sleeping, not keep rewriting one's book and ideas for the benefit of strangers and members of the local chapter of Networking International who haven't read it. "Then I opted out of public life. When I managed to retake control of my schedule and my brain, recovered from the injuries deep into my soul, learned to use email filters and autodelete functions, and restarted my life, Lady Fortuna brought two ideas to me, making me feel stupid--for I realized I had had them inside me all along." Mr. Taleb supports his scholar's life with his wealth. He disdains universities, but the function of the university has always been both the enlightenment of humanity and the support of the conditions of autonomous thought. The university does this for non-rich people. His own experience confirms that detachment, tranquility, and concentration are means of moving beyond the existing and usually failing paradigm. Moving from trading to analyzing and back again, Mr. Taleb rediscovers the necessity of Kantian reason, that which is free of the state's and society's determinations. Plus, "free reason" extremely pleasant. Pleasure is something that the scholar has no right to ask herself to give up, or to abandon to the demands of others.